choir croak out them goodies: Love Story. Since Fleet Foxes was sold out on Saturday night and I was too bitter to bother with their Sunday performance, I headed off to the Egyptian Theater in Hollywood for a showing of Love Story, the documentary on Love that's about to be released on DVD. 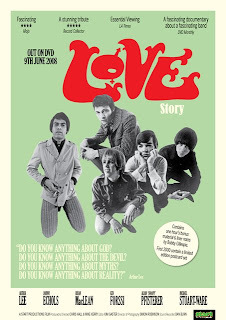 A lot of the content within was information you could probably track down in the liner notes of a Forever Changes re-release, frankly – how “Andmoreagain” and “The Daily Planet” were recorded with Arthur Lee and a set of studio musicians because Forever Changes producer Bruce Botnick temporarily fired the band during a period of disorganization. And how first studio drummer Snoopy (Alban Pfisterer, the band's last choice of drummer, by his account) had such trouble with “Seven & Seven Is” during the Da Capo recording session that Lee switched places at the drums with him for every other take. The Egyptian's audience was actually sort of essential to the film, what with all the giggling every time Snoopy came on and showed himself as an odd, pitiful misfit – oh look, the hippie hanging from the tree, staring at the camera. Cheering when footage of Lee driving down Hollywood Boulevard showed the car to be passing by the Egyptian Theater as we were sitting in it. All that fun nonsense. And there were a few not-so-obvious goodies and tidbits; “Seven & Seven Is” was a cheesy reference to the serendipitous March 7 birthday shared by Lee and his girl of choice. Lee blew a $5000 advance given to the band by buying himself a $4500 two-seater car and distributing the remaining $500. He regretted writing 19-minute track “Revelation” and using it to fill the B-side of Da Capo. What really made this documentary great, though, was how well it reminded that Love's music continues to hold up, that it's still brilliant. Every time the camera cut to Lee or guitarist John Echols reminiscing, with a song like “Maybe the People Would be the Times or Between Clark and Hilldale” playing in the background, I found myself hoping they'd cut the camera away so I could hear the damn song. It's a strange way of putting my appreciation, I suppose, but in truth, I so rarely find myself in the mood to listen to Love, and yet when the music was shoved in front of me I suddenly realized how much I wanted it, even more than those precious personal accounts. I love the part of "Maybe the People" where Lee half-scats along with the trumpet's melody, and admittedly, this bit is far more climactic in my mind than hearing about the bittersweet occasion on which the Doors rose above their enablers. And more, only when it was pointed out on camera that the Manfred Mann version of “My Little Red Book” was in What's New, Pussycat? - a version arguably improved upon in being roughened up by Love – did I realize “Stephanie Knows Who” (Forever Changes) sounds an awful lot like...an improved upon, roughened up version of “What's New, Pussycat?” I'd give anything to be able to live through the mid-'60s and taste something wild for the first time in a world that hadn't yet seen punk, and though I'm not old enough to verify whether Love was really that fresh, the film's accounts certainly had me believing it. The strangest and saddest thing here, I ought to note, was the consideration of age, and all that takes place over a forty year period. Most of the band had aged fairly well by these on-screen accounts in the late '90s and mid-2000s, though on camera you could see Lee's transition from handsome young artist to a man in his late '50s with softened rasp and relatively humbled attitude, even a slight bitterness toward money. It was the epilogue, however, where it really sank in that half of the band had died quite young – Lee's death from leukemia two years ago was relatively high profile, but when text popped up indicating Bryan MacLean's fatal heart attack on Christmas 1998, at 52 years old, it was sort of a shock to think that this footage was dated by at least ten years, and that even though we knew how the story ended, there wasn't going to be that happy news of a recent reunion of any sort. Watch the Love Story promo. Watch Arthur Lee talk about politics in 2005. Excellent, I will look for this. A key part of my musical re-awekening after about a decade in the wilderness was going to see Love in 2004, they were completely stunning.